Hassocks have strengthened their squad for the final few months of the Southern Combination League season by completing the signing of former Woking player George Brown. Capable of playing as either a defender of midfielder, Brown moves to the Beacon having taken a break from football after a spell playing in the United States. A combative individual, Brown has already made quite the mark in a Robins shirt by being involved in all three goals in Hassocks’ comeback from 3-0 down to earn a point against Loxwood on Saturday. He’d only been on the pitch for four minutes when he linked up well with Spencer Slaughter and Phil Johnson to help create Harvey Enticknap’s first senior goal for the club. Brown himself added the second, scoring just seven minutes into his debut after being teed up by Slaughter. He then played a part in the third, releasing Johnson down the left with Johnson’s low cross being slid in at the far post by Slaughter. 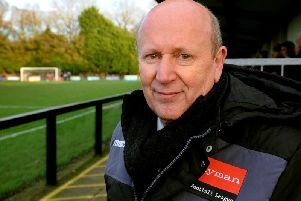 Brown was a member of Brighton and Hove Albion’s academy from Under 8 level right through to Under 18s, after which he moved to be a part of Woking’s youth set up. He went onto captain the Under 18s, Under 19s and Under 23s at Kingfield Stadium, making the Cards’ Conference National League squad on several occasions in the 2016-17 season and playing twice for the first team in cup competitions. Brown also enjoyed a loan spell with the Robins’ neighbours Burgess Hill Town in the same season.